Compte rendu publié dans Acta fabula (mars 2014, vol. 15, n° 3) : "Le philosophe dans la chambre noire. Pour une petite histoire de la singularité photographique" par Stéphane Massonet. 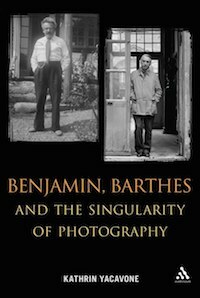 Benjamin, Barthes and the Singularity of Photography presents two of the most important intellectual figures of the twentieth century in a new comparative light. Pursuing hitherto unexplored aspects of Benjamin’s and Barthes’s engagement with photography, it provides new interpretations of familiar texts and analyzes material which has only recently become available. It argues that despite the different historical, philosophical and cultural contexts of their work, Benjamin and Barthes engage with similar issues and problems that photography uniquely poses, including the relationship between the photograph and its beholder as a confrontation between self and other, and the dynamic relation between time, subjectivity, memory and loss. Each writer emphasizes the singular event of the photograph’s apprehension and its ethical and existential aspects rooted in the power and poignancy of photographic images. Mapping the complex relationship between photographic history and theory, cultural criticism and autobiography, this book will be of considerable interest not only to historians and theorists of photography but also to scholars working in literary and cultural studies.